VOMA is the acronym to describe the start of the day at Old Warden, that is,' volume of moving air'! Otherwise known as a strong breeze with a few lulls in between. I figured it would improve, and so it did albeit slowly. Do we let that stop us? Naaahhhh. 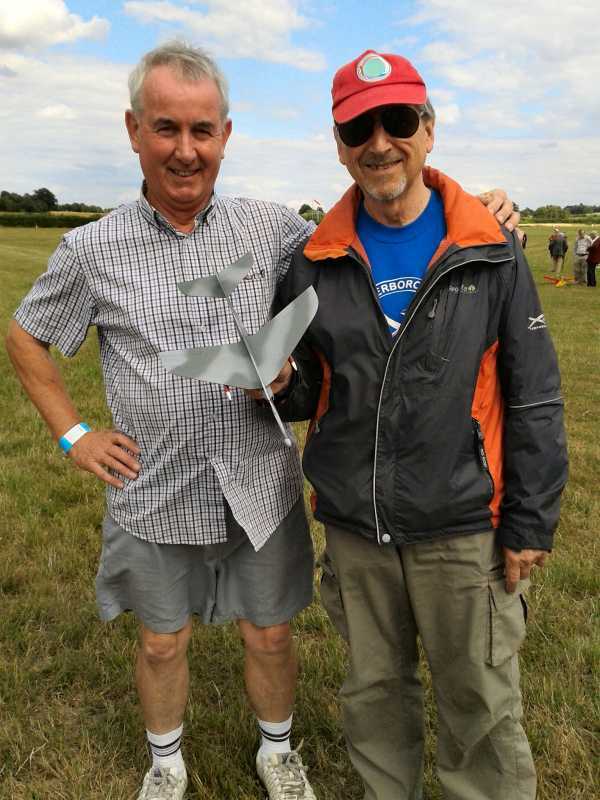 I managed to get some more Rapier motors from our own 'nighthawk', then, after doing a troll of the stalls, met up with Roger who had none other than John Miller Crawford in tow. John had come all the way from NZ. 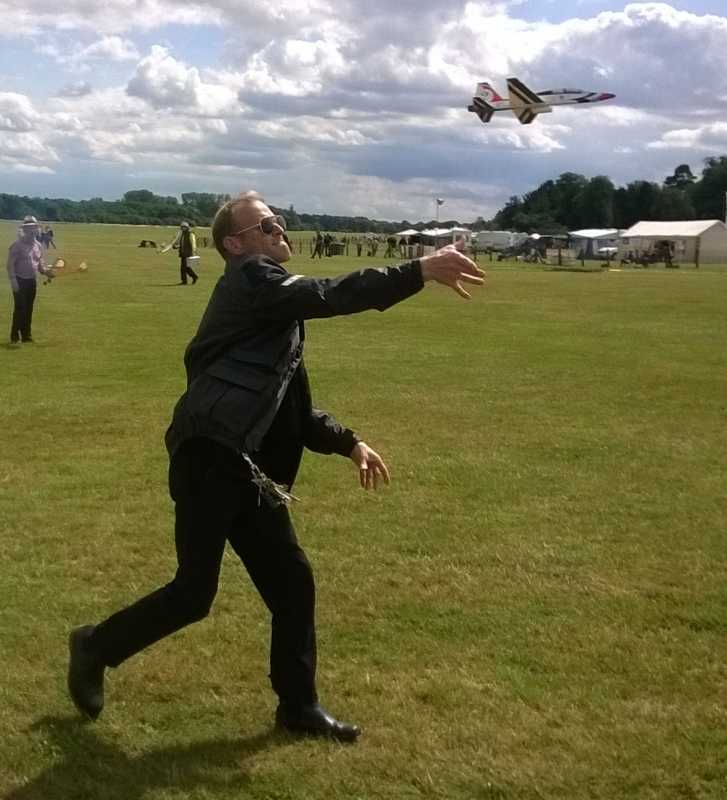 After some eats at midday I thought I'd better do something in the way of flying. First flight of the T38 - stratospheric!!! Mmmm, I thought, was it that good last time? Try another, same thing, cor, this is good I thought. By this time, what started as four individuals on the flying field had swelled to a respectable thirty, and all with different models, from chuckies to ducted fans. 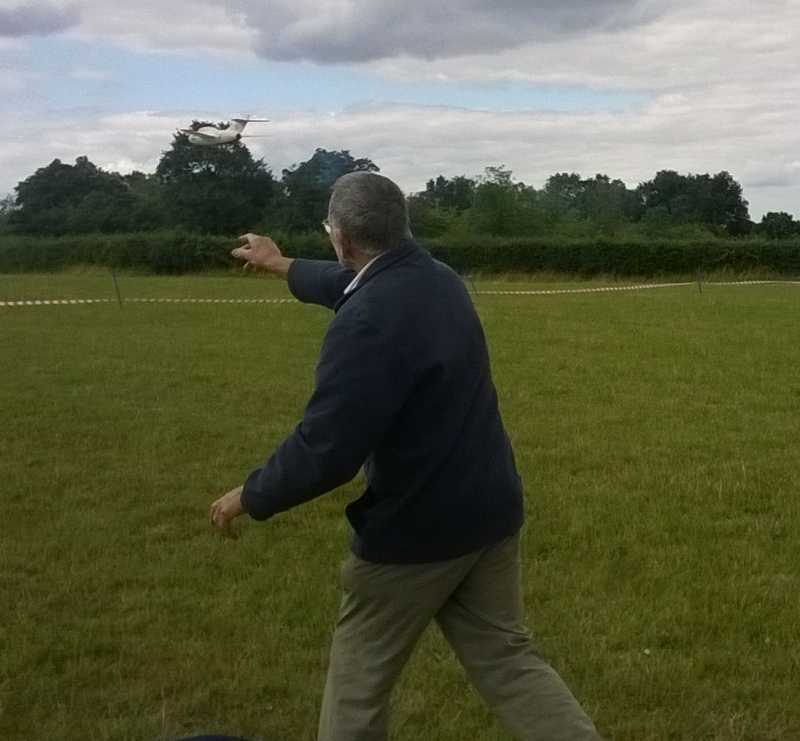 By this time Roger, Ruth and JMC had joined us and we put in some spirited flying. Even Chris Strachan dug out his Rapier powered Miles M-52. This did a tour of the airfield, that really did warm my heart. Above: Chris Strachan's Miles M-52. 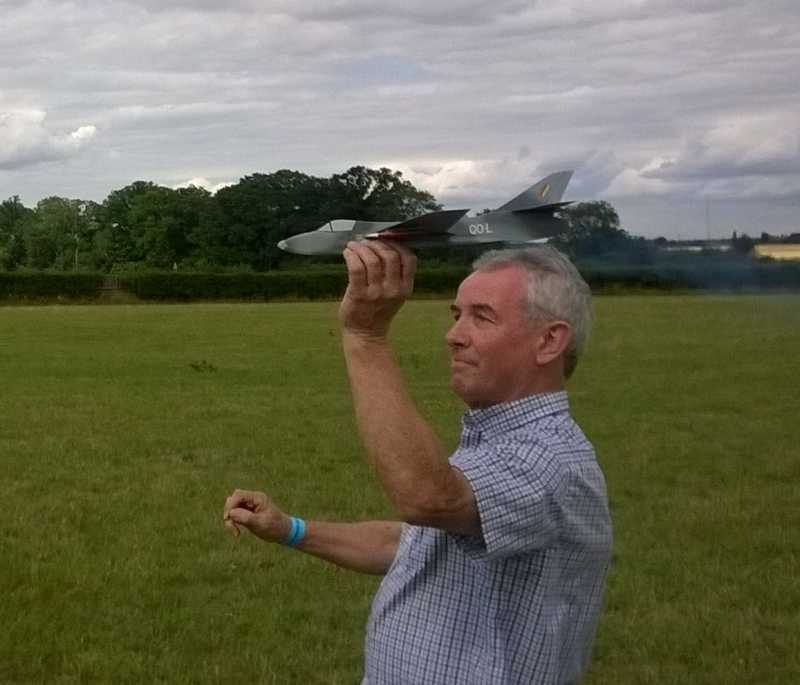 It made some very nice low level flights despite the age of the Rapier's Chris was using. By 5.30 pm all was calm; a last flight I thought, for the Alpha Jet. Oops! 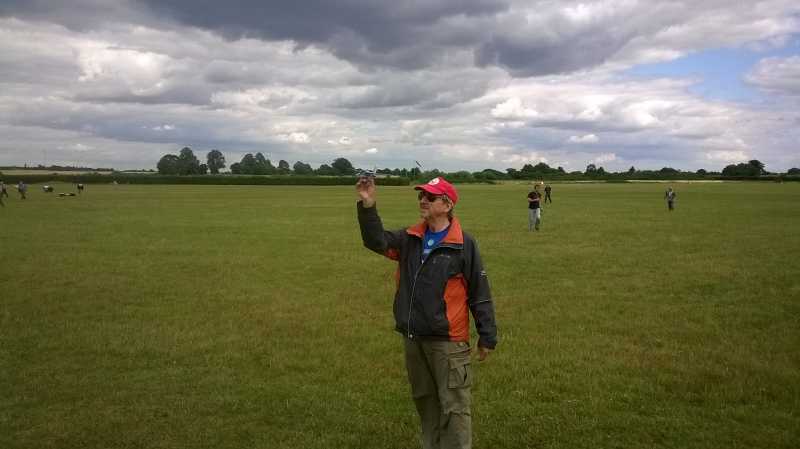 It flew wel - outside the aerodrome and gave a long walk to an adjacent farmer's field. One more flight? Roger wanted me to try the T-38 with a standard L-2 motor to see if it would work. It did - the Talon flew in a more sedate manner, proving it was as good low down as it is in the stratosphere. Great day, I loved it. 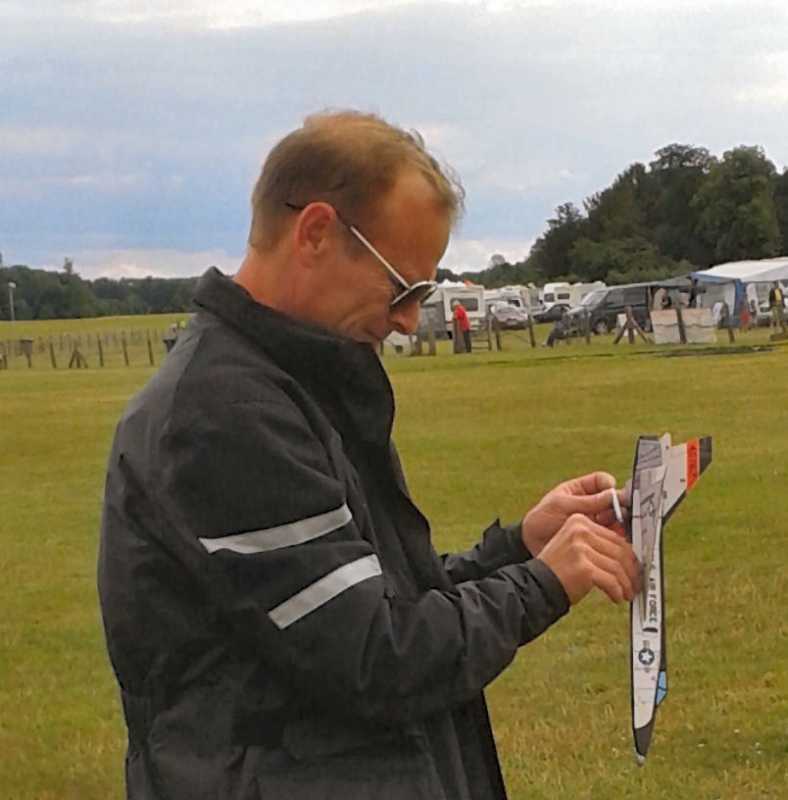 Great to hear that you got some good flying in Andy, and that there were a gang of Rapier flyers later on despite the horrible forecast. My foamy T-38 is my highest climber too so it looks like Roger is on to a winner with the balsa one. And it is a great looker! Above: Talon T-38 made from Depron. 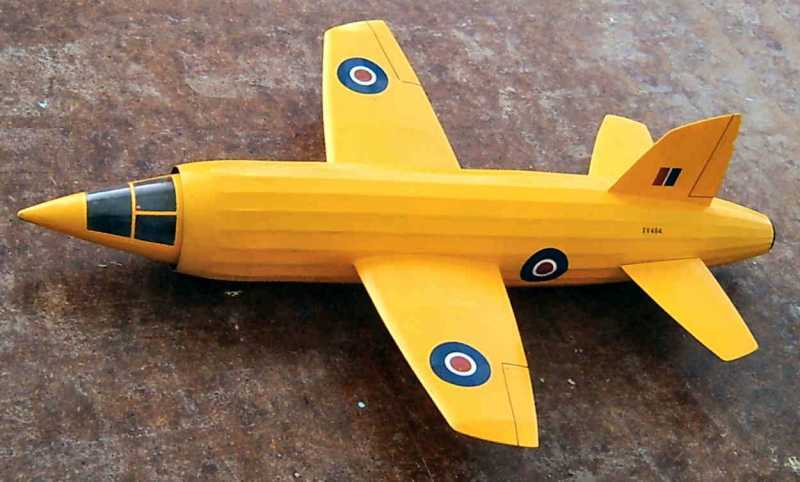 Like Andy's balsa model, it is a spectacular flyer with a Rapier L-2! Nice to see John managed to attend, wish I could have got there too. How was Sunday or daren't I ask? As Andy says in his first posting, we had a good time on Saturday - much better than expected. Flying was possible from about 3.30; by 5.00 it was quite calm, and very calm by 5.30 - hence Andy not knowing which way to launch his Alpha Jet. It made a wonderful flight - out of the field and into the stubble (it has the habit of doing this - it did it at the last Old Warden when it was standing corn!). Fortunately, it was easily spotted and retrieved from the stubble. Sunday was continuously wet and windy and I 'rested up'. 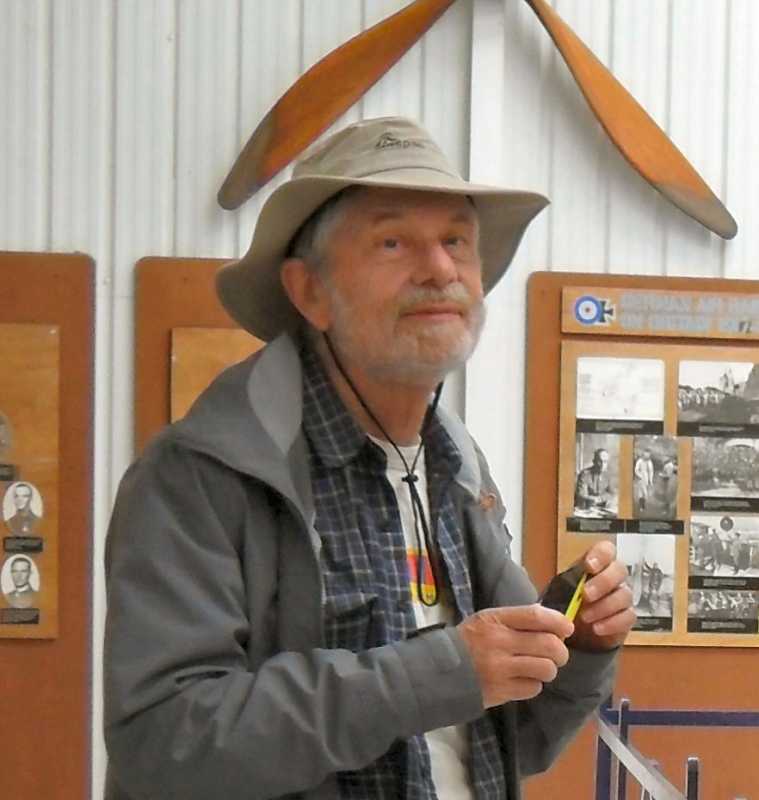 Above: John Miller Crawford, the website developer of Jetex.org, in the Shuttleworth museum. John came from NZ to see some Jetex action. Thanks to Chris Strachan,Tony and Andy, he was not disappointed! He is wearing a Jetex.org T-shirt (still available). Above: atmospheric shot taken by JMC. Note the lowering sky and the angle of the wind sock. But it did calm down later. 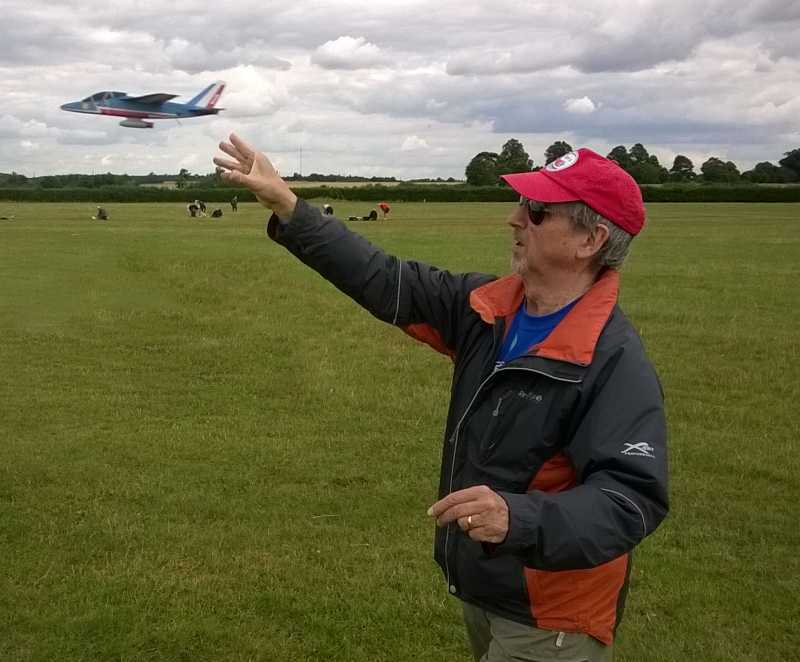 Above:Here's me launching my Alpha Jet. 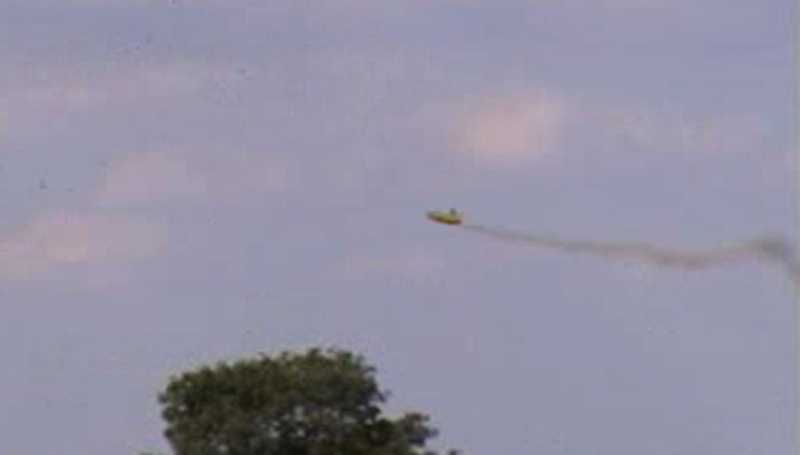 Above: Two shots of Andy launching the T-38. It put in some wonderful stratospheric flights with an L-2X and an equally impressive lower level sortie across the flying field propelled by a standard L-2. 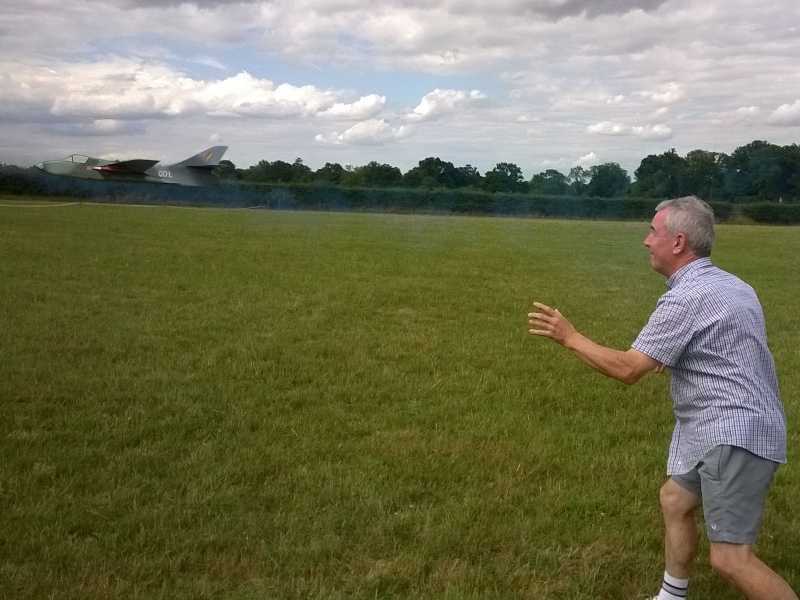 Above: Tony Butterworth just about to launch his profile Hawker Hunter. 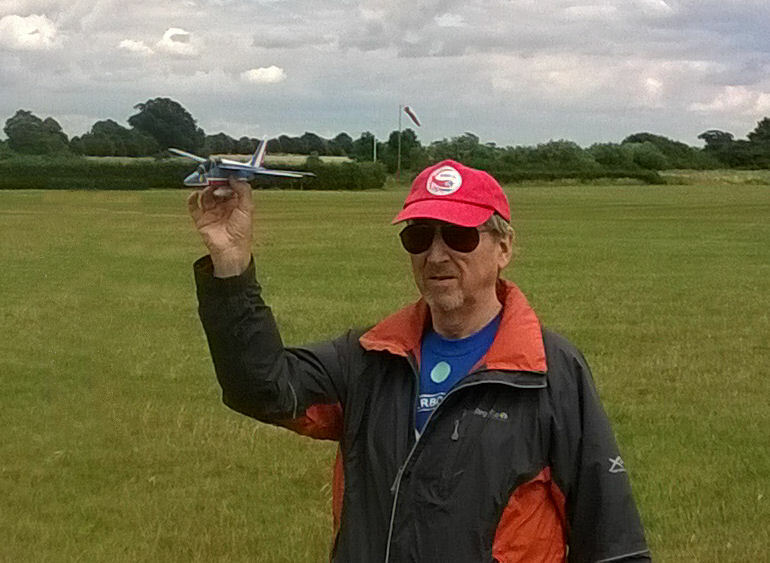 Above: Chris Strachan joined in the fun too: His MiG 15 flew well with some very old L-2 (green cased) motors . Above: It was wonderful to see some new rocket flyers. 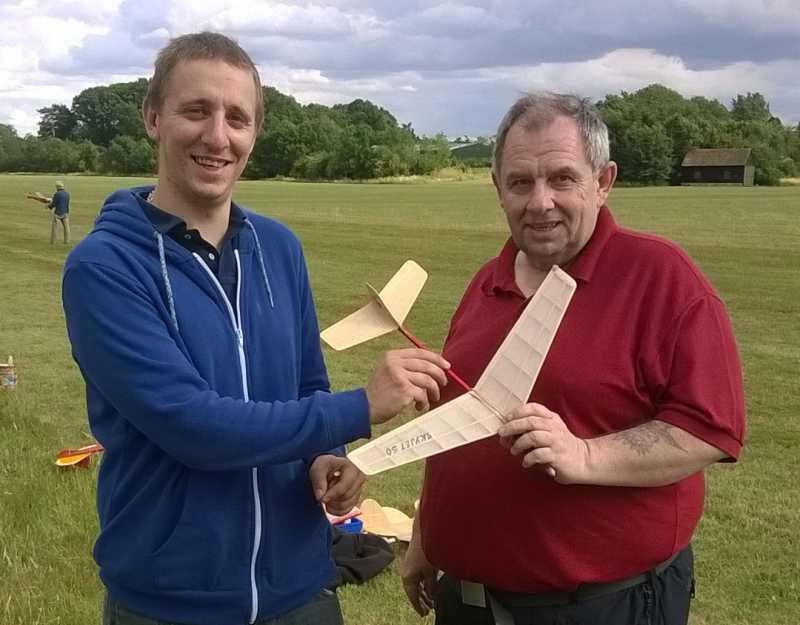 Here's Trevor and David Roberts with their Skyjet 50. Flew well with an L-2. Their bigger Skyjet 100 also went well with a Rapier L-3. I gave them my card and I think they are hooked. Trevor intimated they had both had a lot of fun and were looking for a change from RC . Above: Andy and Tony sorting out the Hunter. This is a model that Bill Dean designed for the 'Eagle'. 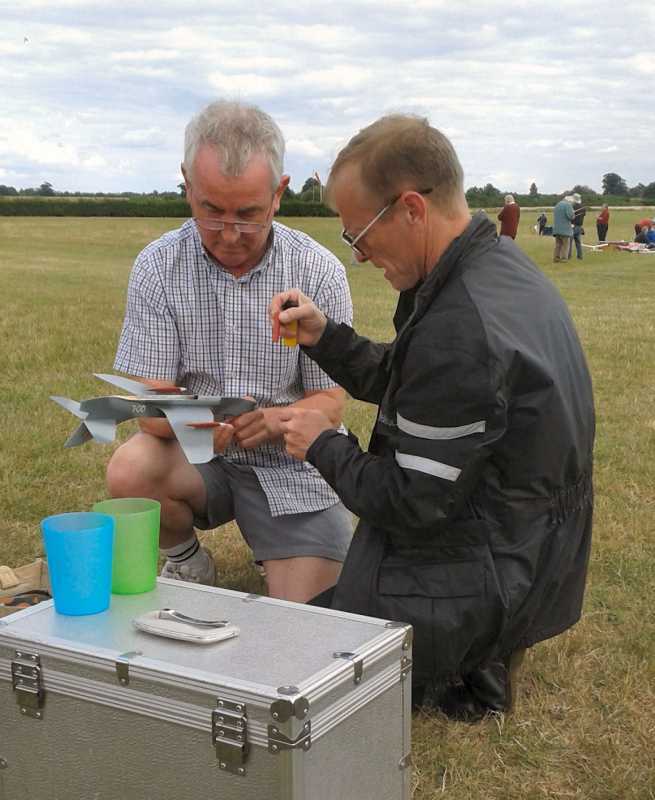 Tony added a shallow trough, which also strengthened the fuselage and pods on the wing to stiffen it. It's quite large and needs an L-2X. Above: Tony well pleased after a splendid first flight that included a climb to great height and a couple of loops at the end. I had to take it easy and was merely an observer of the fun. Above: Andy's F-106 also made a couple of excellent sorties. Note he is lighting his Rapier fuse with a traditional igniter! Above: OW always has interesting bits for sale on the extensive traders line. 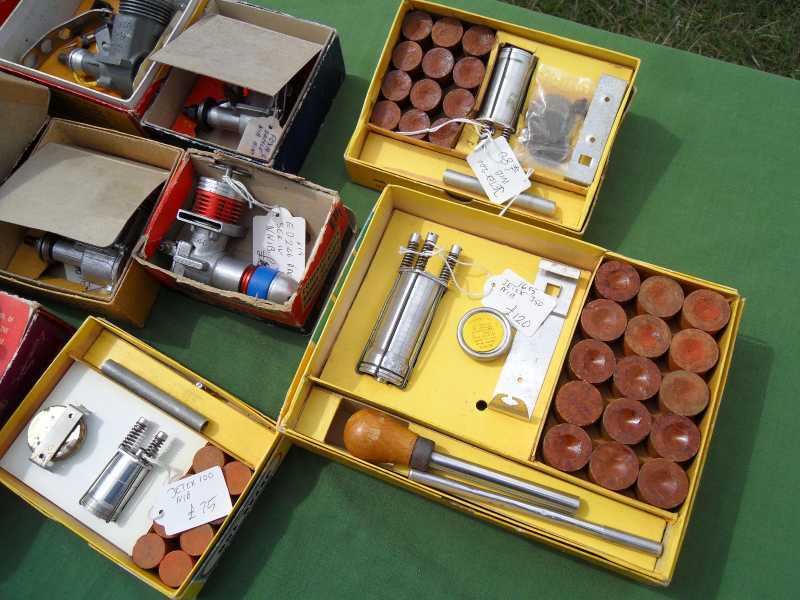 These very nice NIB Jetex motors were most desirable, but rather expensive. I did however, pick up two Jetex 50 motors quite cheaply. So there you have it: Not a few famous flyers did not turn up, such was the dire weather forecast, and both Howard Metcalfe and Chris Richards were unable to make it this time. Nor did Dr Zigmund make the trip. This was a great pity. But we still have motors. And we had a much better day than we expected; we saw many fabulous flights; we picked up some motors, and JMC went home determined to take rocket flying back to New Zealand! 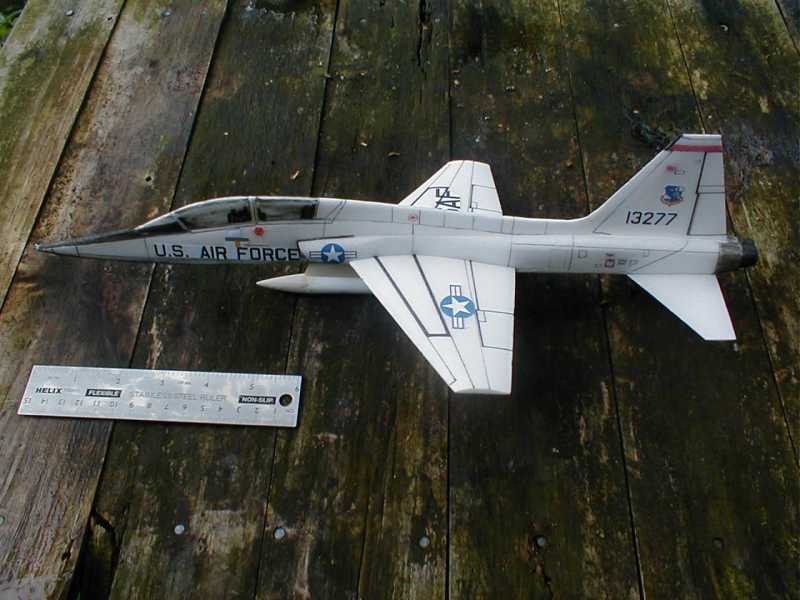 To conclude: Rapier/Jetex flying is still alive and well: we have the models to build (anyone for a T-38?) and motors. So what's stopping you joining the fun? Sorry for the late reply, but Sunday the 26 th was ghastly weather.It rained as we arrived just before 10am. Most bundled into the SAMS tent or the museum for cover and solace! Having oozed around the museum the drumming on the roof suddenly stopped, and on exiting we were greeted by instant strong wind (VOMA). 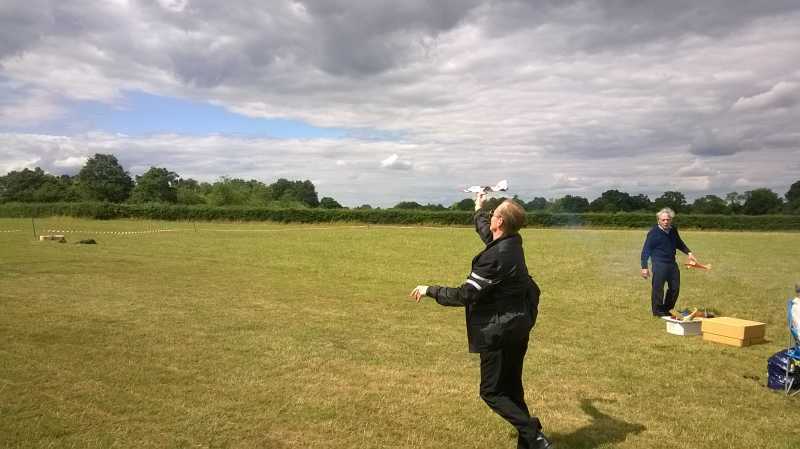 The Masefield trophy was up for grabs so we watched very light tissue covered rubber powered models go to instant warp drive heading for the perimeter - not for the faint hearted. Then the rain came back... and we all scarppered. No worries Andy, I think you all need a medal for going both days when the forecast was so dire, sitting watching the rain on a model outing is not much fun and even though the museum is fantastic there are only so many times you can walk round it. Maybe I will be able to get to the Sept event, will you be able to get down to Middle Wallop later this month, it will be good to see you there? Not sure about a medal, more mangle would be appropriate! I doubt I'll get to MW, to tell the truth I can't admit liking the place. If anything it's too big, with a great big hump and a drive to the toilets. It's not my bag! Sorry about that. Added comment (by Roger): what's the forecast for MW, Howard, and have they cut the grass?